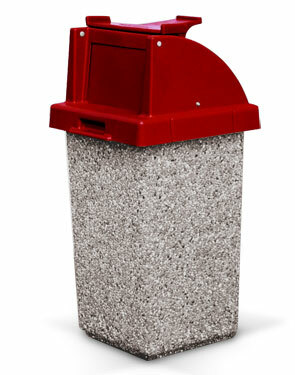 This multi-purpose concrete trash can is the best of the best for efficient waste management, especially in fast food restaurants, cafeteria style eating areas or food courts. The push door lid is the perfect solution for simple high volume trash collection, and keeps unwanted odors trapped inside the receptacle. The tray caddy top makes stacking trays easy and convenient quickening the clean-up process for restaurant workers. This innovative trash can along with the solid steel-reinforced construction will withstand years of usage. Security cable, retainer ring, and leveling feet come standard.